The Marlins former championship contenders have always been built on strong starting pitching, whether the 1997 team built on veterans Kevin Brown, Al Leiter, Alex Fernandez and later on, a young Livan Hernandez or the 2003 team with youthful group of Josh Beckett, A.J. Burnett, Brad Penny and Dontrelle Willis. Since the break-up of the 2003 team, the Marlins have sought a consistent group of pitchers to help bring them back to greatness. But adjustments, injuries and the failure to develop some talented pieces has led to a long list of failed Marlins starters and lost seasons. Now the Fish find themselves in the familiar position of having to develop young pitching. Besides Ricky Nolasco, no starter on the team currently has what anyone would call extended MLB experience, and Nolasco has regressed from a serviceable second or third starter in 2008 and 2009 to a very questionable starter the last two years. In each of the last two years, Nolasco’s K/9 has decreased dramatically to the point that his once most potent weapon, the strike out, is essentially no longer a large part of his arsenal. Nolasco has instead become a ground ball pitcher who relies far more on the two seam fastball than on the four seam fastball. In fact, the data on his arm slot indicates that Nolasco drastically changed his delivery on his four seam fastball during the season in 2012. This normally indicates a pitcher experimenting in-season to increase effectiveness (not overly likely, but plausible), or a pitcher feeling pain or discomfort when delivering a pitch and adjusting his delivery to ease the stress on his body (more likely considering the in-season adjustment). 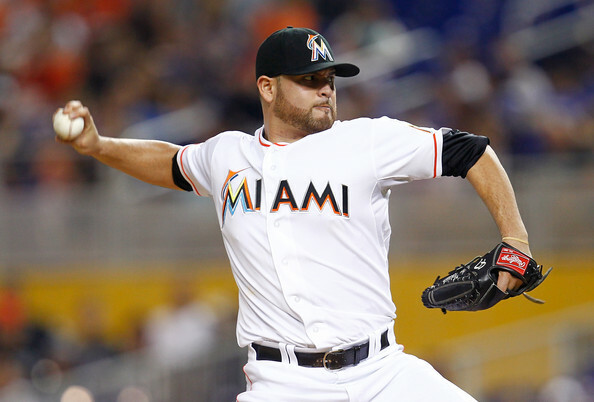 In either case, Nolasco, who turns 31 this Thursday, should not be seen as a long-term solution for this team. In order to focus on resurrecting the Marlins, both as a competitive entity and a profitable one, we need to look to younger arms to devise where the team needs to go next. So as with my earlier review on the Marlins bats, here is the three names you need to know and the Marlins need to succeed moving forward. These names are a bit different from the bats because the Marlins starting pitching is slightly behind its hitting so a couple of these guys probably won’t see intense major league action this season, but are nonetheless key pieces for the organization. Turner will looked upon for improvement in 2013. He was the key player brought back in the Sanchez trade. 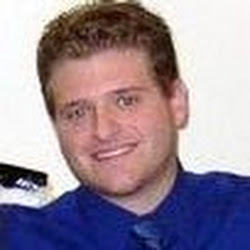 Jacob Turner– Turner was a central piece in the Omar Infante/Anibal Sanchez trade of mid-2012. The Tigers were happy with the results of the trade as Sanchez and Infante helped the Tigers win their second American League Pennant in the last seven years. However, the Marlins satisfaction with the move has yet to be seen. The Marlins acquired catcher Rob Brantly, who most agree will start for the team this season, Brian Flynn, a 6’8 left hander whose upside is probably a back end of the rotation starter or bullpen piece and Turner. While a successful run from Brantly would make this trade a win, Turner is as important to the Marlins future. Turner is a 6’5 righty who began his pro career in 2010 after being the Tigers first round selection in the 2009 draft. Baseball America has ranked Turner in its top 30 prospects each of the last three years, and his ascension to a top of the rotation starter seemed inevitable. However, as with several Tiger prospects, Turner was aggressively promoted and the luster has come off his high end prospect status. Let me be the first to say that I am not sure that Turner is in fact that top of the rotation type ace, but the ability is there and at worst, the Marlins need him to be a consistently above league-average starter to build upon. His fastball velocity needs to sit closer to the 94-95 mph with consistency than the 91-92 MPH Average that we are currently seeing. In order for Turner to become a staple in this Marlins rotation, it is crucial that he miss more bats. Most of his peripherals seem alright, specifically, his ability to control walking opposing batters, but two large issues present themselves upon review. The first is that Turner has had a terrible time with the home run ball. After never posting higher than a .71 HR/9 average in the minor leagues, Turner has averaged 2.13 and 1.47 HR/9 in his two major league stints. Both numbers are well above league average. These numbers need to regress closer to the league average for Turner to give the Marlins acceptable innings. The second problem, which almost assuredly contributes to Turner’s home run troubles, is his inability to strike out major league batters. Turner averaged a K-Rate of 15.8% last season and a K/9 of 5.89. Again, both numbers are well below league average. By way of comparison, his strike out rates are similar to teammate Ricky Nolasco (15%; 5.89). While both pitchers post decent ground ball rates, Turner’s home run rates have made it so he is not even Nolasco’s equal at this point. We need to see several big steps forward in both strike outs and denial of home runs from Turner this year, but I believe given his age, his body style and pedigree that such development is possible and necessary for the Marlins future success. Jose Fernandez will definitely be worth coming to see – whether he is in Miami or in the Minor Leagues. 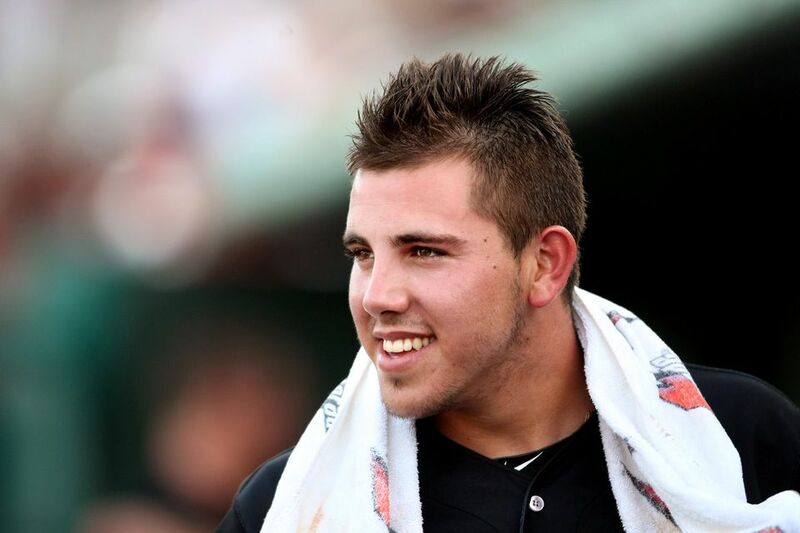 Jose Fernandez– Sometimes, you just strike gold. I think the Marlins may have done so with prospect Jose Fernandez. In last week’s article we reviewed in depth Christian Yelich as a prospect that Marlins’ fans needed to keep an eye on. I’m telling you right now, keep both on Fernandez. This is a guy you should be checking minor league box scores for. Coming out of Tampa Bay as a high school prospect, the Marlins drafted him first in their 2011 Draft. He has done nothing, and I mean, nothing to disappoint. He has posted K/9 rates that are superstar level at both low and high A level ball. It is important with any prospect to temper expectations, but if the Marlins have a future ace, this is him. After pitching 55 innings in high-A (and dominating to the tune of a 1.96 ERA and 59 Strikeouts in 55 Innings), it is likely that Fernandez will start 2013 in High A and with similar success should find himself quickly promoted to Double-A. It will be important for the Marlins to be patient with Fernandez and allow his stuff to develop sufficiently before testing him against major league hitters. This may be the biggest challenge for the organization if Fernandez continues to miss bats at High-A and Double-A, but I feel like the Marlins must be patient because this player could be a key asset for several years in the future. Justin Nicolino also came over with Alvarez. 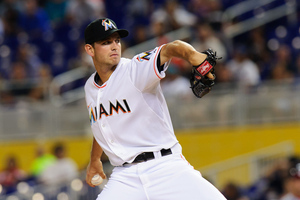 Justin Nicolino– Nicolino is the most talented pitcher acquired by the Marlins in the trade with Toronto. His development is crucial in providing the Marlins with a long term asset to eat innings and help move the franchise back to competitiveness. Nicolino was one of three starters in the Toronto system that had many people talking along with Aaron Sanchez and Noah Syndergaard. Nicolino is an interesting piece. His K/9 rates have decreased as he has advanced through his pro career (which is really only two seasons old), which is obviously concerning. Many have pointed out that his fastball is not as advanced as some of his contemporaries, but his command/control are both tools that have been raved about in reports. Keith Law named Nicolino as a sleeper prospect to for the Blue Jays in 2012, and Nicolino turned in a 2.46 ERA and 119 K’s in 124.1 IP. He should start the 2013 campaign in Double-A for Miami. It will be important for Nicolino to maintain an above average strike out rate at the higher level. The key for his future is not necessarily to be an ace, but to maintain a reasonable strikeout right while using his above average command to get hitters out in the strike zone. Marlins fans should keep their eyes on Nicolino’s numbers in the minors as 6’3, 20 Year Old could find himself as a late season call-up in 2013 and potentially fighting for a position in the Marlins rotation as early as 2014. Alvarez came over in the trade with the Toronto Blue Jays. He should have more success pitching in the NL. The pitchers that will help decide the Marlins future are a bit further away than their important bats. There are other pitchers who will help build a bridge to the Marlins future such as Henderson Alvarez and Nathan Eovaldi. Both pitchers are more likely long term space holders than actual difference makers in the Marlins rotation. Most of Alvarez’s perpherial stats suggest he will serve as essentially a replacement level starter whose job it will be to eat up innings while the Marlins wait on development of more impressive assets. His K/9 is embarrassingly low (3.8). He generates a very low swinging strike percentage (5.1% to a league average of almost 9.1%) and hitters seem to square up his pitches and make contact at a very high rate- 92.2% on balls in the strike zone and 88.8% at all pitches both are above league average. What all this information tells us is that Alvarez’s stuff may never play in the major leagues. Certainly, he should not be counted on for more than a place holder unless we see radical development from the 23 Year Old. Eovaldi is, also, 23, and shows slightly more promise than Alvarez, but this doesn’t mean Marlins fans should expect much. Eovaldi also has trouble generating strike outs at even a league average rate, but his swinging strike rates and contact rates seem to indicate a more acceptable package than Alvarez. Eovaldi was worth about 1 win above replacement last year and should be a similar pitcher this year, which makes him an acceptable back of the rotation piece for a rebuilding team in need of cost controlled assets, but again, barring a major change in stuff, Eovaldi is another replacement level starter. It’s very important that Marlins fans understand patience with this pitching staff. There may not be an ace in the group at this point, but hope exists with Jose Fernandez that one is on the way. The development of Fernandez as top of the rotation starter along with Nicolino and Turner as acceptable 2/3 type starters will be a large, if not the largest factor, in determining this organizations ability to succeed in the future. 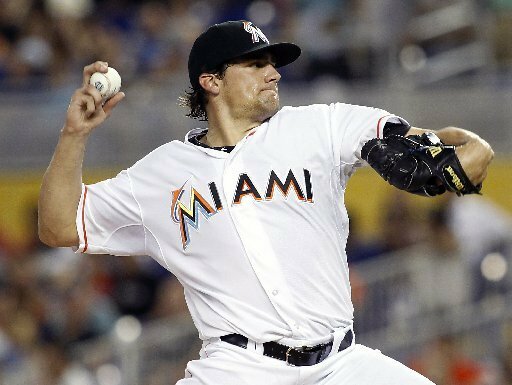 nathan eovaldi cam back in the trade for Hanley Ramirez. The pitching nucleus is all about the same age and level. You might see an early 2000’s Oakland A’s scenario – when they featured three young staff aces in Hudson, Zito and Mulder with the collection of these young pitchers for Miami. Posted on December 14, 2012, in The Rest: Everything Baseball and tagged @Nross56 on twitter, al leiter, alex fernandez, anibal sanchez, brad penny, brian flynn, christian yelich, henderson alvarez, jacob turner, jose fernandez, justin nicolino, Keith Law, kevin brown, livan hernandez, miami marlins, nathan eovaldi, new marlins ballpark, nicholas rossoletti, noah syndegaard, omar infante, ricky nolasco, rob brantly, toronto blue jays. Bookmark the permalink. 3 Comments. News from Miami, Jeffrey Von Steingrabber III offers R.A. Dickey a “wimpie” deal. I’ll give you $1.00 to pitch this season and $1.00 back loaded each year for the next 27,999,999 years. “I don’t care” Steingrabber is quoted as saying, “I own Mayan art work, let’s see him try to collect”. That’s pretty funny right there.